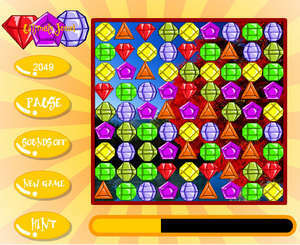 Ultimate Jewel is a game where you simply make rows of three, four or five gems and they disappear, only to have new gems falling down. Make combos and you will have gems raining down. After filling up the bar at the bottom of the screen to full, you proceed to the next stage. For security reasons, you should also check out the Ultimate Jewel download at LO4D.com which includes virus and malware tests. Additional screenshots of this application download may be available, too. Ultimate Jewel has a presence on social networks.